I saw Anthony Robbins the other day on the Today Show. He was talking about helping folks deal with the current difficult financial times. He told Ann Curry that the financial experts he consults told him they thought there was a good possibility things would get much worse (I’m paraphrasing here). In that moment, I felt a bit sorry for Tony. A lot of people think his job has to do with being positive. It doesn’t really. It has more to do with getting results. How can you get results if you don’t first understand where you are? That sometimes means taking off the rose colored glasses! If (and it’s an if) the stock market continues down from where it is, you’re better off knowing that’s going to happen than trying to think your stocks higher with your positive attitude. Thinking that your positive thinking alone will lift your stock portfolio, help your team win, make you more money or cure your cancer is a recipe for disaster. I sometimes see the same attitude from NLPers. They are rightfully jazzed about the enormous potential NLP and hypnosis hold for improving lives. Hey, so am I. But then I’ll hear them say, when it’s not especially appropriate–“Come on, you can do it. Keep your chin up,” or some other positive blather. I know lots of people who have tremendous positive attitudes but little skill and little desire to develop skill. Why? 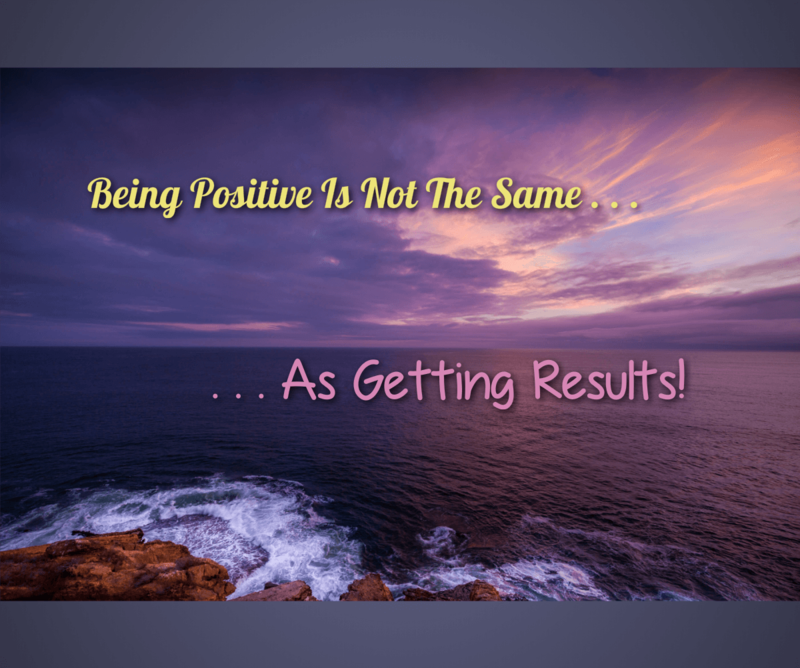 Because “If I just keep my positive attitude, everything will turn out fine.” Many of these folks don’t even run with the opportunities the universe drops on their front door! There’s a word for people that has positive attitudes and take no action–losers. But there is an NLP technique called reframing that sounds similar to positive thinking. So, what is it and what are the differences between reframing and positive thinking–the differences that make a big difference! In NLP, reframing can be thought of as helping someone alter their perception of an experience so that it has a more positive, practical or useful meaning to them. Now, that reframe alone would not typically be enough to have someone stop smoking. But, it would be part of the process. It would help take a belief that runs counter to success and help align it more toward the goal of stopping smoking. Hypnotic suggestions tend to work best when there’s not a stronger counter-suggestion already present! A belief can be thought of as a hypnotic suggestion. If a person has a preexisting belief that runs counter to your suggestion (such as they won’t be able to quit because…), your suggestions will battle it out in there. An easier way to proceed, for everyone, is to loosen up those old belief systems before you fire yours in. It’s true in therapy, persuasion, sales, personal relationships… anything. If someone wants to stop smoking and expresses how it’s going to be difficult to quit, what is their emotional state likely to be at that moment. Maybe frustrated? Resigned? Probably not positive! What happens if you express a view 180 degrees opposite of what they’ve just said? “Come on. You can do it! Keep your chin up. Think positively.” My guess is that they would be annoyed. I would be. I can be stubborn–I’d dig my heels in and defend my belief, making things worse. Also, you’d lose rapport with me. Depending how set a person is in their belief, you might even make that reframe a two step reframe. Initially, get agreement on how consistently they’ve behaved. Later on, suggest that their ability to be consistent will be helpful. In my experience, it’s better to come at that belief obliquely. Give them a way to think about it that they’ve never thought of before. Whatever they’ve done so far is an accomplishment, an achievement. Figure out how their ability to achieve can help them in their current goal. If you can do that, you will surprise them. They’ll say things such as, “I’ve never thought of it that way before.” The surprise will help take them out of the negative emotional state and lead them toward a state that’s more conducive to getting to their goal. I’ll leave you with one last thought about positive thinking. I’m sure I’ll take a lot of crap from the positive thinking crowd (comments are open on this post). I’d like to hear your thoughts. Having a positive attitude doesn’t directly affect head and neck cancer survival, according to one of the largest and most rigorously designed investigations ever on the subject. More than 1,000 people head and neck cancer patients were studies and positive emotional states did not correlate with a higher chance of survival survival.